With Christmas only 1.5 weeks away, cookies are coming out of more and more ovens in preparation for the festivities that await us. It’s an impulse, an undeniable need to bake and bake and bake at this time of year, but not as a slave to the ancestral urge to fatten ourselves up for the cold, winter months that lie ahead. No, it’s something much more altruistic that drives this bake-fest. The whole point of baking cookies is to give them to others, after all. Tasty little morsels that travel well, they’re just begging you to share the joy–nobody can possibly eat 5 dozen of them by herself anyway (no, that’s not a challenge!). That’s the great thing about The Great Food Blogger Cookie Swap–spreading the joy with others who are sure to love food as much as you do! This year, all participants in The Great Food Blogger Cookie Swap were asked to make a small donation to Cookies for Kids’ Cancer. A small gesture really, but an important one. AND OXO was kind enough to match all our donations AND send us each a Be A Good Cookie spatula for doing our part. Everyone wins! It was raining cookies here for a bit. A dozen each from 3 different bloggers, to match the dozen each I sent to 3 other bloggers. Nancy of Rivertree Kitchen shared some Browned Butter Bars with Chocolate Ganache. Kristina at Foodnook made Double Chocolate Double Mint Cookies. 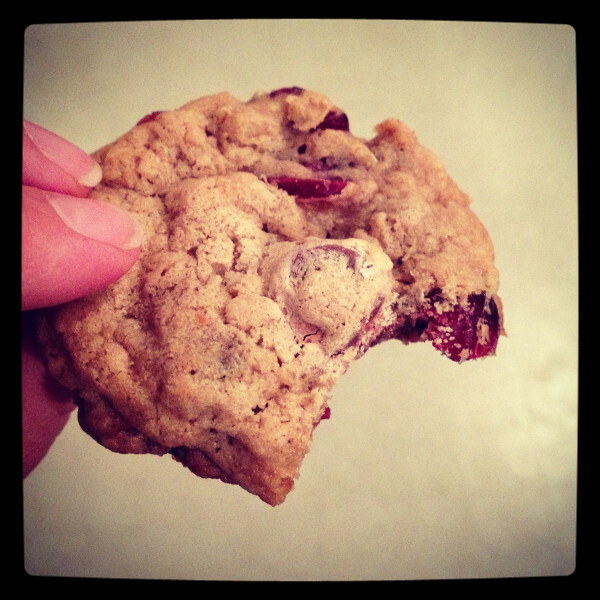 And the Oatmeal Cookies with Chocolate Chips and Cranberries from Dana of Food For Thought were AMAZING. I couldn’t get enough of them! I’ve never been a part of a real-life cookie swap (unless you count cookie baking days with my sister as swaps), but this virtual one has been a more-than-adequate substitute. Loving it! I bet you’re wondering what I sent out into the world as my ambassador? 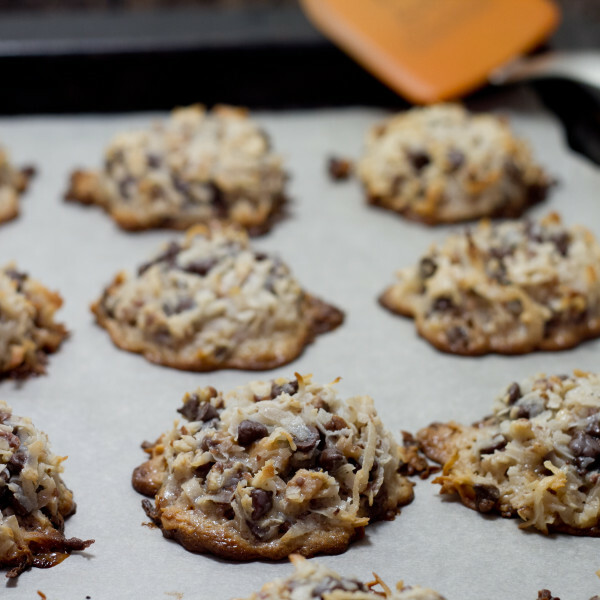 Macaroon Cookies. There’s nothing plain Jane about these bites–they’re full of toffee bits, toasted pecans, and mini chocolate chips. The best part? There are only 5 ingredients and you only need one bowl. In fact, you can hand-stir them, too. Easy peasy, low on the mess factor, and yummy in the tummy! My favorite combination! You could spruce these up a bit with those pretty little seasonal chocolate chips in red and green hues, but I liked mine just fine the way they were. And now that I’ve shared them for The Great Food Blogger Cookie Swap, I’m going to share them with my family and friends. I suggest you do the same. Preheat oven to 350 degrees Fahrenheit. Line 2 baking sheets with parchment paper and set aside. Dump all ingredients in a large mixing bowl and stir until well-combined. 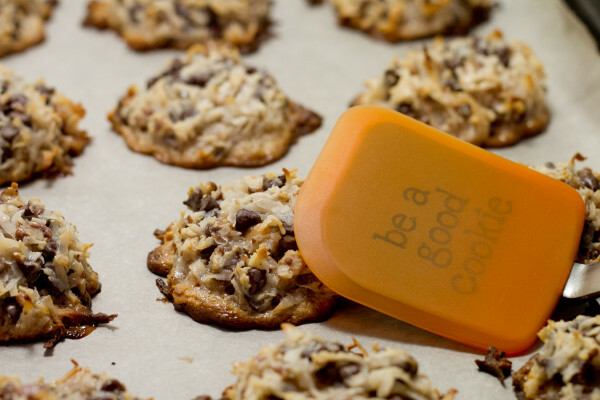 Using a medium cookie scoop, portion out macaroons on prepared baking sheets, spacing 2 inches apart. Bake on the middle rack for 12-15 minutes, or until lightly browned on the edges. Let rest on cookie sheet for 3 minutes before removing to a wire rack to cool completely. Store in an air-tight container at room temperature for up to 5 days. Interested in participating in The Great Food Blogger Cookie Swap next year? You can sign up here to receive notification of when they’ll be accepting bloggers for the program. In the meantime, there will be a round-up post coming on Love & Olive Oil and The Little Kitchen including all the 2012 participants on Friday! 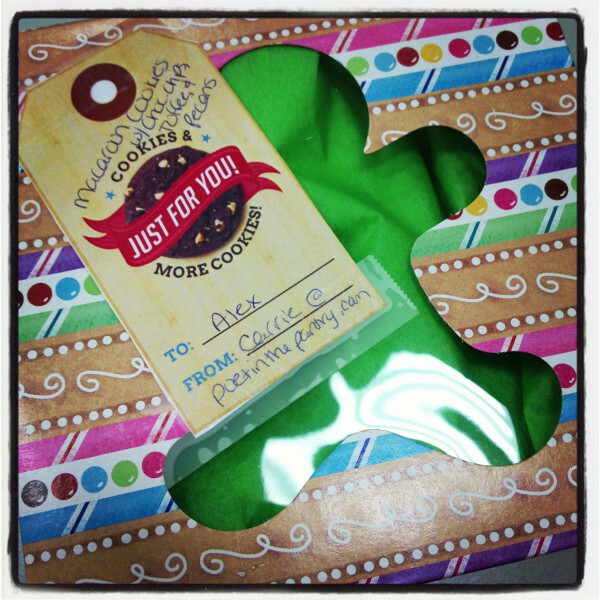 If you were participating in a cookie swap, what would you send the other swappers? YES YES YES YESSS please! thank you for the tasty cookies! the packaging was so cute also! So glad you like them! 🙂 Happy to hear they arrived safely!